Experience the firm support of this white goose down pillow. 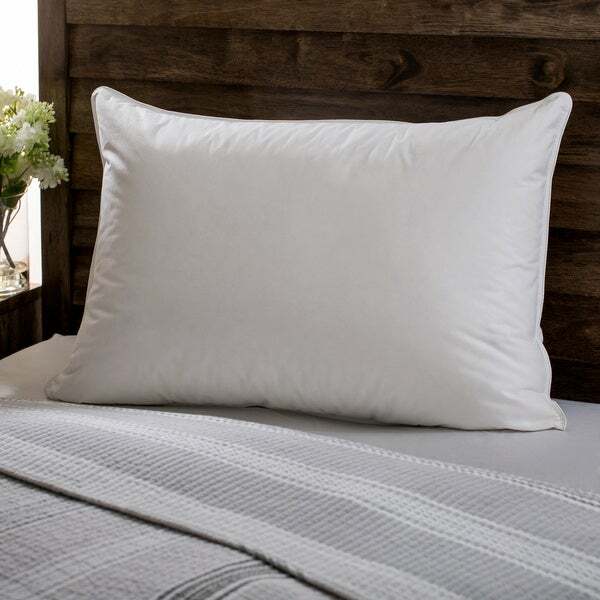 With a luxurious 100 percent cotton, 300-thread count cover, this pillow is machine washable for easy maintenance. To ensure even down distribution and comfort, simply fluff your pillow once a week. This hypoallergenic pillow features piped edges for added strength and durability. Not as firm as I would have liked and must be fluffed daily. I tried a few and this one has worked well enough. Pleased with comfort level but it's going on two weeks and my bedroom still smells like a chicken coop. Put it outside today in sun and if that doesn't work, then it's a $130 loss. Seemed to be similar to previously purchased item that was well liked. I am constantly tossing and turning and need a good pillow to help me sleep well. Hoping this one does the trick, for what i know about feather pillows I think I chose a good one. "what exactly label on this pillow says about type of down and % of down ?" Hello ula, there are no feathers in this product. The law tag will say 75-percent white goose down, the remainder 25-percent is broken fabrics of down clusters, but no feathers. Thank you for shopping with us! "HOW MANY PILLOWS COMES WITH THIS? IS THIS A WHOLW SET?" Thank you for contacting us, Constance. This is only one pillow. Please let us know if you have any further questions.